Winter is rapidly approaching. While QLD doesn’t see the types of freezing temperatures as our southern friends do, there are occasions where your horse might appreciate a snuggly rug overnight. Here are some tips on how to work out if you should rug your horse or not. What breed is your horse? 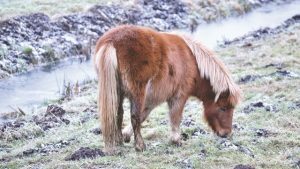 Most breeds, especially ponies, grow quite adequate coats during winter that protect them quite well. More refined breeds such as pure Arabians and Thoroughbreds not as much. If you have one of these breeds who tend to have a thin coat all year round, then rugging is probably a good option. What’s the weather like? Is it cold but fairly dry, or is it constantly wet and muddy or even snow? If it’s the last two, then it’s a good idea to rug them just to help give them a break from the wet and cold. How frequently is your horse worked? If you have a horse that is ridden every day or competes frequently, then you want to reduce the amount of fluffy coat that you have to deal with. Rugging is a good way of limiting hair growth, but it is something you would have to keep doing regularly. On the other hand, if the horse is only ridden every so often then it might be better to allow them to grow out their coat. Just take extra time to dry them off when you do work them. Does your horse lose condition easily? If you have a horse that drops condition quickly and requires hard feeding all year round, then rugging is definitely a good choice. This means he won’t burn energy and fat trying to keep himself warm. What rugs do you have available? If you only have a heavy thickness winter rug, then you probably only want to use it when it is really wet and cold and miserable overnight. If you have a variety of different rugs for the seasons, then maybe a lighter rug overnight might be a good option. A rug like that could also be left on during the day if needed. We hope this has given you some guidance on whether to rug your horse this winter season. If you ever need to move your horse from one climate to another, you can contact us at East Coast Horse Transport for all your Brisbane, Sydney, Melbourne and surrounds travel! https://www.eastcoasthorsetransport.com.au/wp-content/uploads/2018/06/pexels-photo-297201.jpeg 360 640 pippa https://www.eastcoasthorsetransport.com.au/wp-content/uploads/2017/05/New-Logo.jpeg pippa2018-06-14 01:05:422018-06-14 01:05:42Should You Rug Your Horse? Horsey Antics for Your Tuesday Is Your Horse Drinking Enough Water?